When the sun shines bright blue above the green of the vines and hills of the Yarra Valley, and you have a designated driver or seat on a coach sorted, plus you're sporting a wristband worth $40 of entitlements, Grape Grazing is a wondrous festival. Held over 10 days in mid-February, and featuring the majority of vineyards in the area, it culminates on one weekend with a dozen or so wineries putting on food and entertainment. 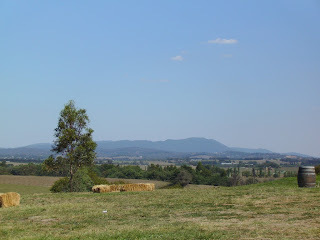 We were just in Yarra Glen to visit family, however, and thought initially that, since we weren't officially taking part in the festival fun we might miss a chance to try out one of the region's newcomers. I had been keen for some months to try Zonzo Pizzeria at Train Trak vineyard, but the restaurant itself was closed over the weekend. Luckily, they were selling a selection of pizzas as part of the festival and, since we got there late in the afternoon, they didn't need us to be paid-up festival goers to gain entry to the party. The vineyard is worth visiting for its situation and view. The outlook, over the vines in one direction and the valley and hills beyond in the other, is a wonderful contrast of deep blues and greens. When the restaurant is running at full swing it offers a range of almost 20 pizzas, all priced at $16.90. Pancetta, proscuitto and gorgonzola feature strongly. For festival day they had four pizzas available and I didn't need to read any further than the Pizza alla salsiccia: pomodoro, taleggio cheese, Italian pork sausage, Spanish onion and rosemary. 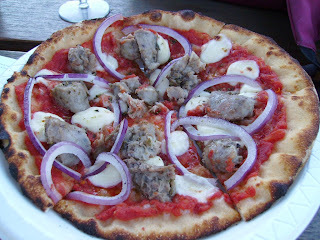 The pork sausage lay on the sweet, chewy dough base in chunks, with visible studs of fennel in the sausage meat. The rosemary, though dried, was a strong presence. Happily the taleggio didn't fight against the meat and herbs for flavour dominance and instead met its purpose in holding the pizza together. This single example off their menu hit the spot and left me very keen for our next trip to the valley and opportunity to sample more.